To assert the legitimacy of its off-roadiness, the Chevy Colorado ZR2 is going to take on the grueling 550-mile Vegas To Reno desert race this weekend with its stock engine and transmission. And license plates; this competition truck is totally street-legal, according to GM. Street-legal, but not exactly showroom standard. 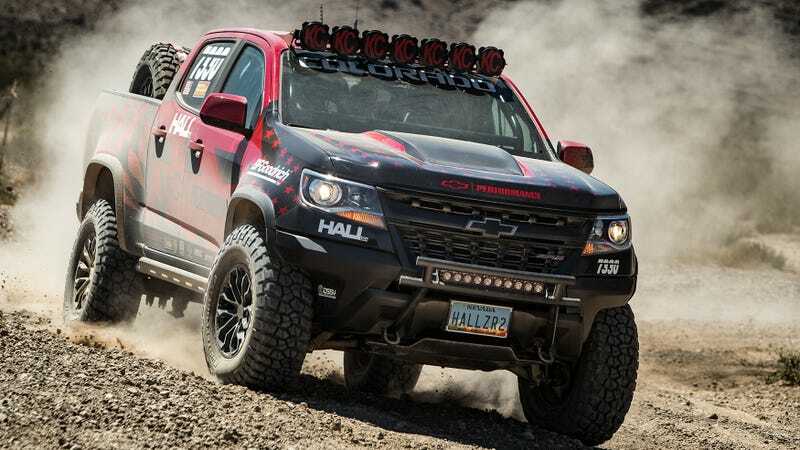 While GM claims the race truck, to be driven by Chad Hall, will run the Colorado ZR2’s regular 3.6-liter V6 and eight-speed automatic, the race truck will use a “modified version” of that fancy Multimatic spool-valve suspension tech we has so much fun taking off jumps a few months ago. GM is declining to disclose specifics on what’s different about its race truck’s shocks, but promises to reveal more details “soon.” For what it’s worth, the “stock” EcoBoost Ford Raptor that ran this race, the Mint 400 and the Baja 1000 last year also ran a “modified” version of the Fox shocks that come standard with that truck. Interestingly, this race-trim Colorado seems to have ditched the 31-inch Goodyear all-terrain tires it was wearing when I test drove one in May for a set of aggressive BF Goodrich M/Ts, though I can’t tell what size they are and that information isn’t specified in GM’s press release. The race rig will also be fitted with safety gear, a roll cage, 44-gallon gas tank, radios, race GPS and a whole bunch of KC lights. Chevy’s ZR2 will be competing in Class 7300, which appears to have been created specifically for this vehicle since it’s not in the rulebook published by Vegas To Reno’s sanctioning body The Best In The Desert. But the race, which kicks off August 19, is a hell of an opposition in of itself. The 550 miles of hard-driving in the dirt is no joke. And even though the course won’t be exactly the same as it was when Ford ran its “stock” entry last year, I’ll be a little curious to see how the performance of the two trucks compares. Besides doing halo-car duty and getting some great photographs to turn into dealer posters, Chevy says this ZR2 race program is supposed to be a test bed for accessory parts that might find their way onto the truck’s option list. Even if it’s not “showroom stock,” I’m excited to see how this truck throws down this weekend. And certainly looks good in race livery. But seriously, if anybody at Toyota’s desert program is reading this, get that Class 7000 Tacoma we saw at the Baja 500 to Vegas and give this Chevy somebody to fight.